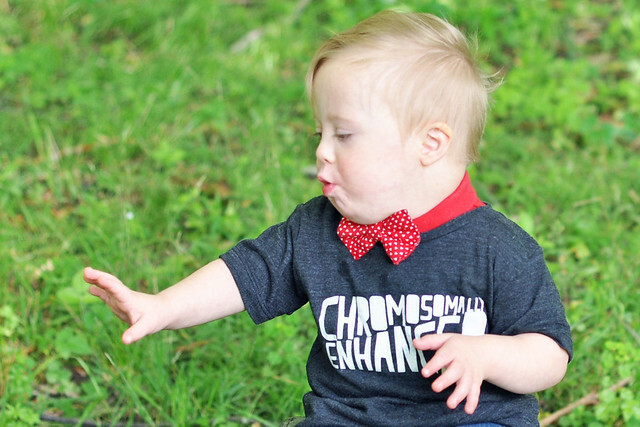 I am often asked what it's like to have a child who has Down syndrome. That's SUCH a loaded question. I often wonder if the person asking wants me to reply "Oh, it's so difficult!" so they can nod their head with sympathy. What I actually say is, "Not that much different than having a typical child." This is usually met with a look of disbelief. 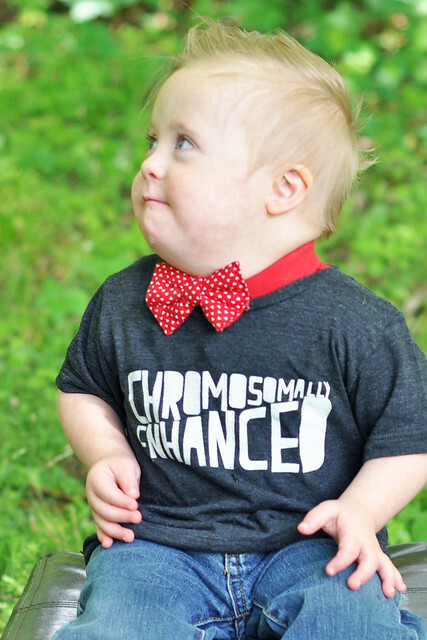 But here's the thing: Down syndrome is not as big of a deal as it's made out to be! It's not a monster who wants to ruin your life and steal your happiness. THAT'S the truth that needs to be told! It needs to be told to everyone. It needs to be SHOUTED OUT so the message is heard around the world. My former self would have stared in disbelief. My former self would have felt pity. My former self? 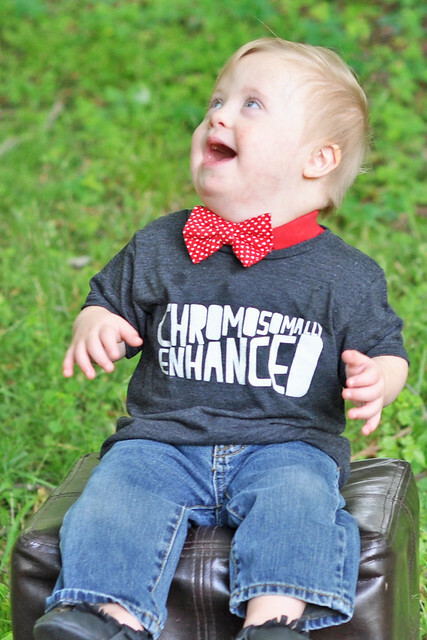 Didn't understand what Down syndrome really was. Right after Liam was born, and we were told the suspicions, I begged God to take it away. I prayed that the lab results would be negative. 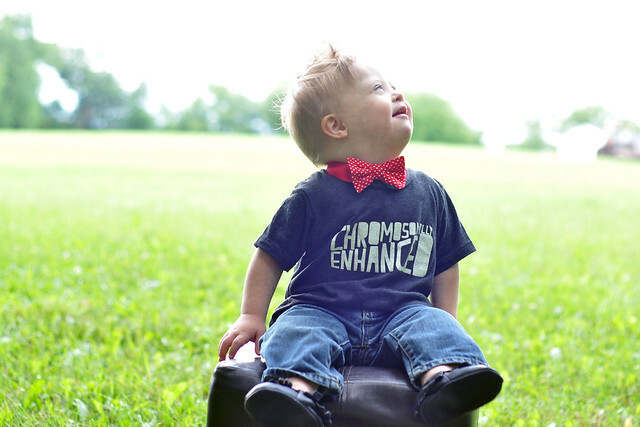 Parenting a person who had Down syndrome felt like a prison sentence. I never thought I would laugh, smile, sing, dance, or have fun again. As the days passed, I fell head over heels in love with my sweet boy and I realized just how special he was. When the doctor called 2 weeks after his birth with the test results, I didn't even flinch. I already knew Liam was perfect just the way he was, and life returned to normal. Yes, I said it. Normal. Almost 2 years have passed since Liam was born. We are smiling. We are laughing. We are singing. We are dancing. We are having fun. 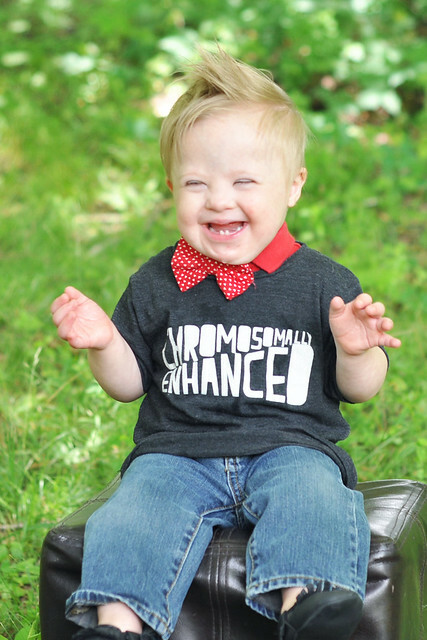 Most days I completely forget Liam has Down syndrome! Sure, there are therapy sessions to help him reach milestones, but he's reaching them. There are more yearly appointments, but that's just to catch any issues before they become a problem. 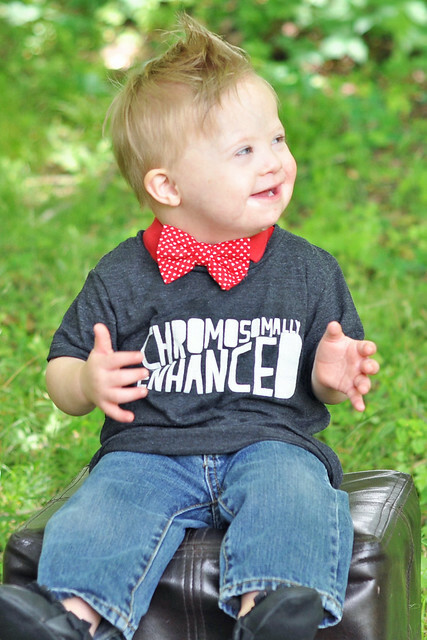 Inclusion, early intervention, and close medical attention is making a world of difference. Now, more than ever, there is SO much hope and these kids are exceeding expectations! I have NO doubt that Liam will do the same! Our life isn't much different than it was before Liam was born. We attend storytime, have picnics, and visit the park. We go out to eat, run errands, and go shopping. We have playdates, visit family, and go to church. We go to the zoo, go to museums, and attend functions. We go to movies in the park, go swimming, and go to baseball games. We eat meals together, have Family Movie Nights, and play outside. Liam is just like any other toddler his age. He can walk, talk (and sign! ), and feed himself. He can bounce, dance, and wave. He loves books, cars, and playing outside. 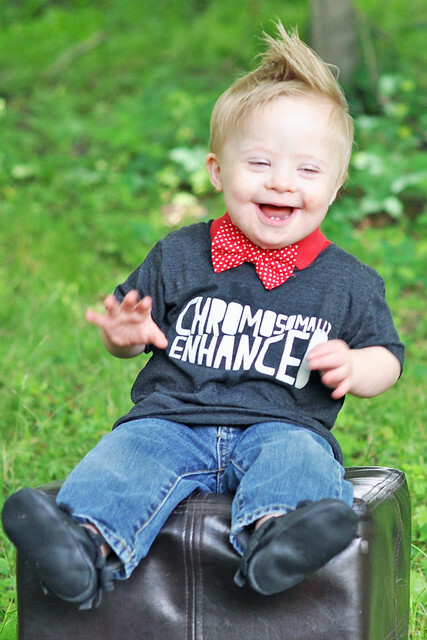 He smiles, laughs, and loves to socialize. Liam is so much more than a diagnosis. Everybody wants and expects to have a typical child. The typical lifestyle is appealing. As a parent, we want our kids to be a success, get married, have children, and have an easy life. But let's be honest. Life isn't easy. Having a typical child does NOT guarantee a typical lifestyle. Many children will grow up to lead not-so-typical lifestyles. The majority of parents will face some sort of difficulty with their child at some point. All of our challenges are different. My parenting challenge is nothing compared to parents who are dealing with kids who have cancer, mental illness, or drug addiction. 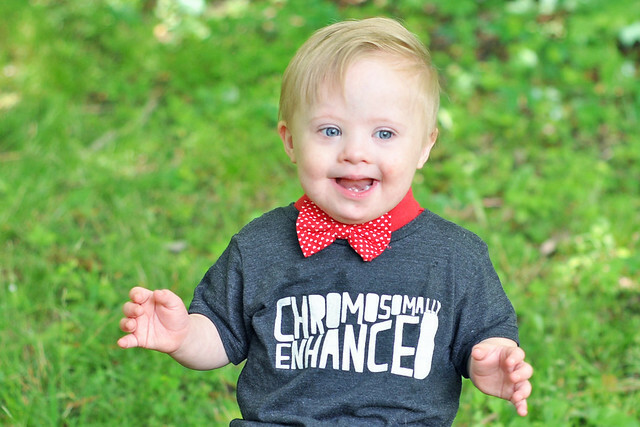 In the grand scheme of things, having a child who has Down syndrome is not that big of a deal. Even if he is dependent for the rest of his life, we still win, because we will get to see that incredible smile every single day. Finding the beauty in life-ALL life-is the key to happiness. 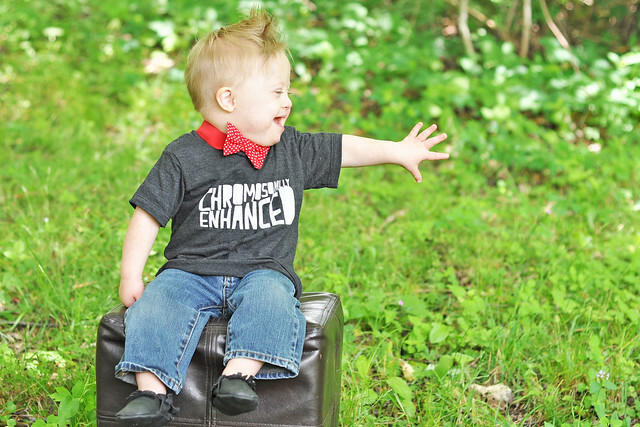 I can't even imagine life without Liam and I can't even imagine life without Down syndrome. 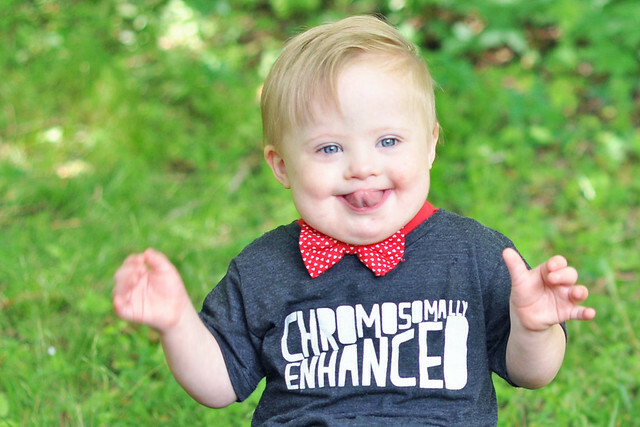 The saying is true: We are BLESSED with Down syndrome. For most people that's hard to fathom. But you can't truly understand something until you live it. I'm living it, and I wouldn't change a thing! Even if I had the capability to make it go away, I wouldn't. I fear that if it went away, it would take away his incredible joy, his huge personality, and that smile that is so contagious. Thinking of all that being gone immediately brings tears to my eyes. I LIVE to see that smile every single day and watch him laugh his way through life. His presence makes our lives infinitely better! 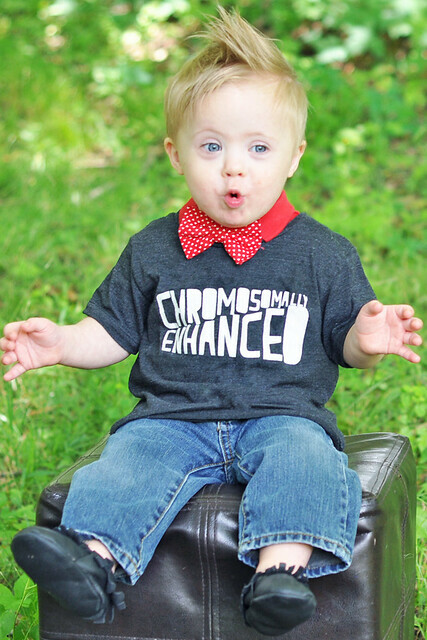 Liam's extra chromosome makes the light in his eyes just a bit brighter. It makes his hugs just a bit tighter. 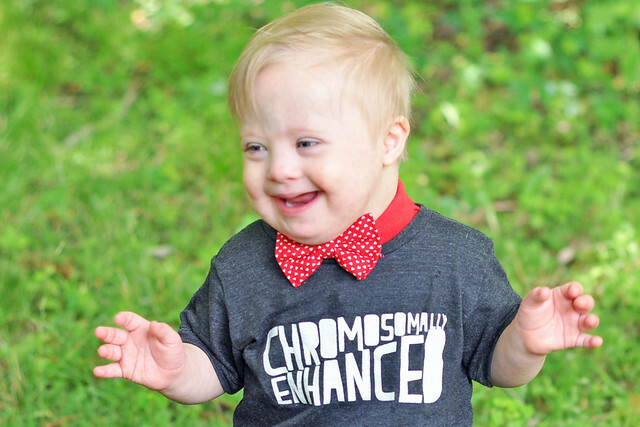 It makes his contagious smile just a bit happier. It makes his joy radiate through his entire body. It gives him a personality too big to fit inside that tiny body. It fills him with so much sweetness, goodness, innocence, and purity that it takes my breath away. May the light that makes him shine so brightly never fade. 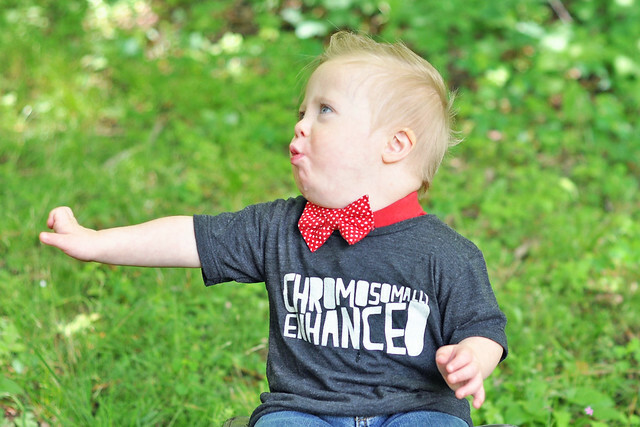 I definitely didn't even know I wanted a child who had Down syndrome...until I had one. Liam is no mistake. God knew EXACTLY what he was doing and exactly what I needed. Living life comes so easily to Liam. Live, Laugh, Love, and trust in God. I was given the gift of a life blessed with something a "little extra." For that, I'm forever changed and eternally grateful. Fantastic pictures Liam........ but your a professional with that smile I must say. THIS POST is amazing. i love every bit of it! and liam is just adorable. Such a beautiful post. And can I just say, he needs to be a model. Every single shot, he is just SO adorable!! Thank you so much! I am so thankful for all the people that came into our lives when Liam was born. I was truly missing out before! XOXO You have such a big heart! He is the cutest baby ever. Always remember God only gives us what he knows we can handle. This is a beautiful post! And it's obvious from all your posts and pictures that Liam is a happy baby and that happiness is infectious to those around him! Thank you so much! That is definitely true! Go Liam! Yes, live, love, laugh, and trust in God. I want to make this my slogan too. 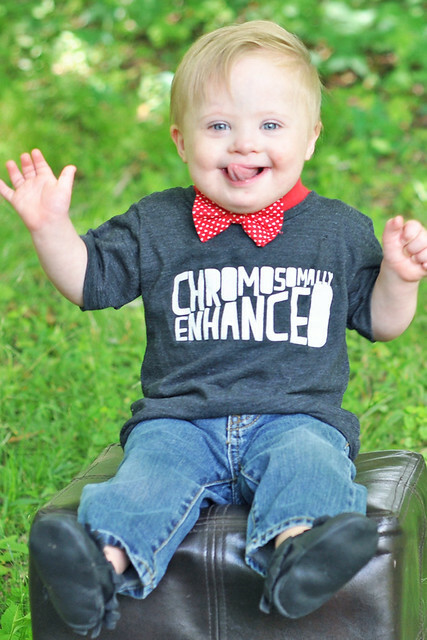 What an awesome little boy! It's a good mindset to have! XOXO Thank you so much! My daughter was just born on Sunday with DS. We were completely unaware and the past several days have been filled with many emotions. I can't tell you how much I needed to read this. Thank you for writing it and sharing your beautiful son's story. Thank you for sharing. 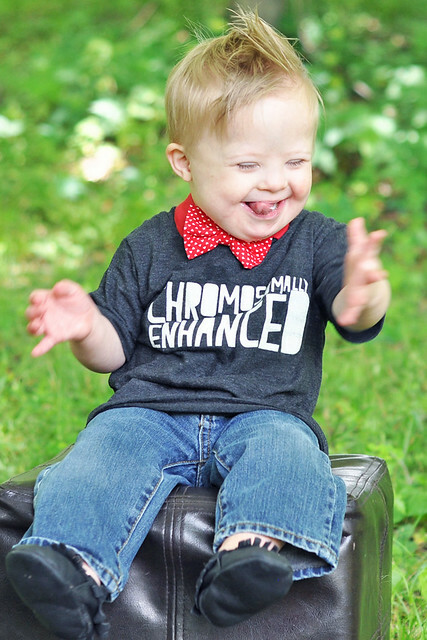 I have a 1 month old baby boy with Down syndrome and your post brought me to happy tears. I know exactly what you mean with getting the results and not caring because you love your son so much that you wouldn't change a thing. Thank you so much for those beautiful words. 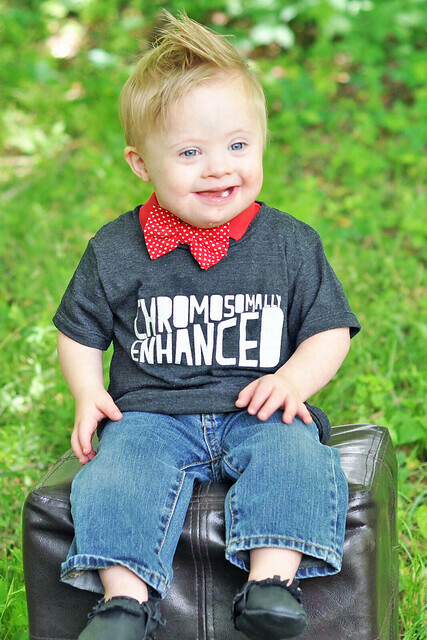 We found out our daughter had Down Syndrome when I was 11 weeks pregnant and were urged to abort. Of course we never could have: we already adored her even though we had never met her. Now she is two months old and I can't imagine life without her. Not only have my husband and I been blessed beyond measure by her presence in our lives, but everyone she comes in contact with ends up glowing with the reflection of her joy. Thank you again for sharing. I wish more people knew and understand what a gift these precious children are. Congratulations, Allison! You certainly were given a gift! This post was awesome, I shared it on my social media. Please check out this week's T21 blog hop as this post won the featured spot over at CedarsStory.com!